What the heck is a manufacturing PMI report and why are they important for investors? 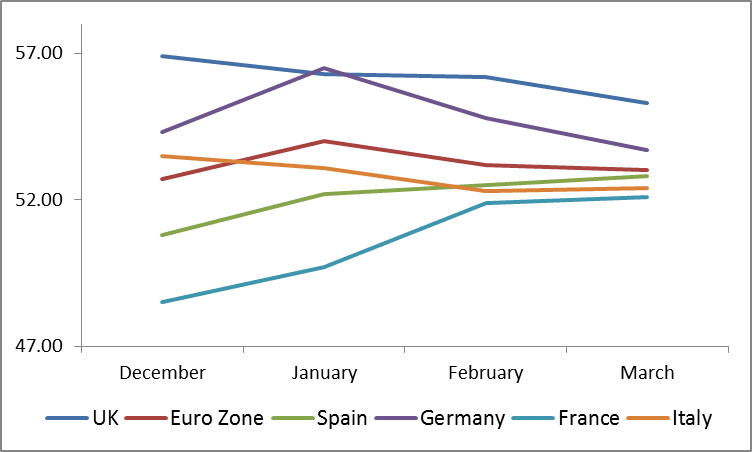 Let’s take a look at the latest manufacturing PMI releases of the major economies. What the heck is a PMI report?! A purchasing managers index (PMI) report is simply a measure of business conditions in an industry taken some time in the middle of the month. In a manufacturing PMI report, a few hundred purchasing managers from the manufacturing industry are asked about their opinions on issues such as employment, inventory levels, new orders, and state of production and supplier deliveries. An index reading of 50.0 and above hints at optimism among the manufacturers, which could lead to industry expansion. Consequently, a reading of 49.9 and below denotes pessimism and a possible contraction in the manufacturing sector. Let’s take a look at how the major economies are doing so far this year! Japan’s numbers started the year on a weak note as heavy snow hit some areas. What’s more troubling though, is that it’s still declining despite the production demand ahead of their sales-tax hike. 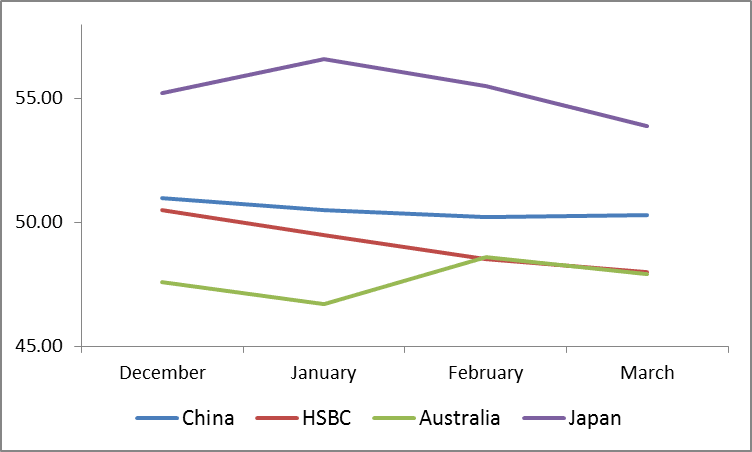 China’s official and HSBC readings are also slowly slipping, which is prompting speculations that China’s Q1 2014 growth could come in below the government’s estimates. One look at the chart above tells us that manufacturing in France and the euro zone are on its way to recovery. In fact, France had just posted its fastest growth rate since June! Unfortunately, the optimism is offset by weakening production in Germany, the region’s largest economy. This is probably why investors are still on the lookout for signs of more stimulus from the ECB. Meanwhile, the U.K.’s manufacturing figures suggest that while the industry is still expanding, it’s now doing so at a slower pace. 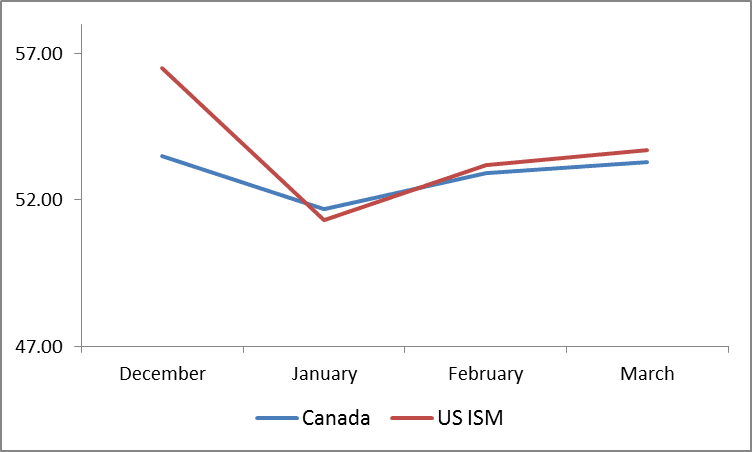 Manufacturing in Canada and the U.S. both took a tumble as the region got hit by heavy snow in the first months of 2014. Both their charts are looking promising though, with Canada getting a boost from new orders and a weaker currency while the Uncle Sam is just plain on its way to recovery. Of course, the charts above are just the first readings this year. It would be interesting to revisit these charts once Japan has implemented its sales-tax hike; China is over its holiday production lags, and the North American region isn’t plagued by severe snow storms. For now though, I hope these charts give you a good snapshot of how the manufacturing sectors of the major economies are faring so far this year.